For the dairy industry, the options for producing a late-summer emergency forage crop are limited, mostly because the growing season is relatively short. Recent research has shown that oats, seeded in late-summer, can provide an excellent source of emergency forage before winter. Furthermore, fall-grown oats offer some very unique quality characteristics that dairy producers can use to their advantage, either in specific response to a forage deficit, or as a routine part of their forage management program. This Focus on Forage report will outline these unique quality characteristics, and provide some basis for their unique nature. What is hardening and how does it affect the quality of fall-grown oats? Winter-annual cereals (wheat, barley, rye) undergo a process called hardening when fall-seeded plants approach winter. Generally, these plants accumulate various compounds within individual plant cells that increase osmotic pressure and provide protection against freezing/winterkill. One of the principle compounds accumulating in these plants is sugar, which is highly desirable from a nutritional perspective. Although oat plants seeded in late-summer will not survive the winter, these plants will still go through the process of hardening. As a result, oat plants typically exhibit increased concentrations of sugars during late fall, which also serve to stabilize concentrations of forage fiber (NDF) and energy (TDN). The practical consequence of these factors is that fall-grown oat forages have a relatively wide harvest window in which many quality characteristics are relatively stable, and are not linked directly to any specific plant growth stage. 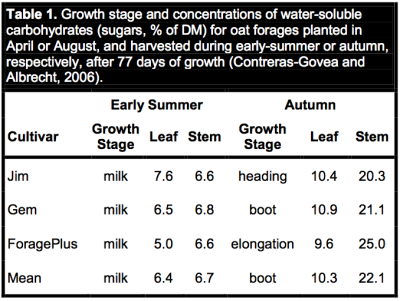 A recent study conducted by University of Wisconsin agronomists (Contreras-Govea and Albrecht, 2006) compared three cultivars of oats (Jim, Gem, and ForagePlus) that were planted in mid-April or early-August at both Lancaster and Arlington, WI (Table 1). In both cases, plants were harvested 77 days after planting. Two points are immediately obvious from this table. First, all cultivars matured more rapidly following an April planting date, with each cultivar at the milk stage of grain fill 77 days after planting. However, Jim, Gem, and ForagePlus were at the heading, boot, and stem elongation stages of growth, respectively, after a comparable growth interval following an August planting date. In part, this occurs because oats has a long-day requirement for flowering that is disrupted by a late-summer planting date. Furthermore, cultivars selected specifically for forage production, such as ForagePlus, typically mature more slowly than grain types, which is far more noticeable following late summer establishment. More importantly, concentrations of water-soluble carbohydrates (sugars) were 61% greater in leaf tissue and 330% greater in stem tissue following an August planting date compared to typical April establishment. These accumulations of sugar within fall-grown oat forages have exceeded 30% of total plant DM for individual plots harvested recently within other studies conducted at Prairie du Sac and Marshfield, WI. It also should be noted that oat plants that are too mature at the onset of cold weather will not accumulate sugar. Generally, plants should reach boot stage around October 15th in order to achieve good yields of DM coupled with desirable hardening, but this rule-of-thumb will vary with cultivar and year. How does hardening affect concentrations of NDF? As oat plants joint, elongate, and produce seedheads during the fall, concentrations of forage fiber will increase, much like spring seedings. 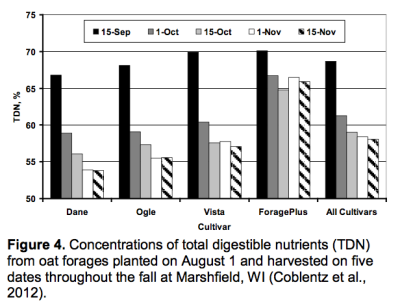 This is illustrated in Figure 1, where four oat cultivars (Dane, Ogle, Vista, and ForagePlus) were planted on August 1st and harvested on five dates throughout the fall at Marshfield, WI (Coblentz et al., 2012). For all cultivars, concentrations of NDF increased through October 15th, primarily in response to stem elongation, but generally did not increase thereafter. For Dane and Ogle, which are early-maturing, grain-type cultivars, NDF remained largely unchanged over an extended period of time (October 15th through November 15th). In contrast, NDF concentrations for Vista and ForagePlus, which were the slowest maturing cultivars in the study, actually decreased between October 15th and November 1st. This did not occur because of loss of forage fiber; rather, it occurred because the existing NDF was diluted by large accumulations of sugar. Depressions in NDF were not observed for Dane and Ogle, largely because they were more mature at the onset of cold weather, and did not accumulate as much sugar. Furthermore, late-summer plantings disrupt the long-day photoperiod requirement for flowering and suppress maturation rate, which also acts to limit NDF. The practical advantage of these processes within the plant is that fall-grown oat forages often exhibit a wide harvest window in which yield increases without the usual trade-off with declining forage quality. How are concentrations of lignin affected by fall growth? Lignin can be viewed as the portion of forage fiber that provides rigidity to plants, allowing them to remain upright. It is especially important in grain crops because it provides structural support for the seedhead, and reduces lodging. Unfortunately, lignin also is completely indigestible, and limits utilization of the forage fiber by ruminants. 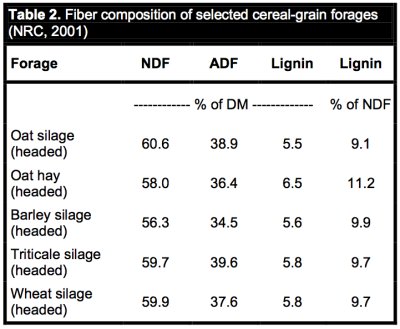 Tabular summaries of forages (NRC, 2001; Table 2) show that headed cereal-grain hays and silages are relatively similar in composition, with average NDF and lignin concentrations of about 59% and 5.8%, respectively. As such, lignin comprises approximately 10% of the cell wall (NDF) within these forages, all of which mature during early summer. Maturation during early summer is significant because higher temperatures are known to increase deposition of lignin; therefore, growth and maturation under cooler temperatures common during the fall should result in reduced lignification of forage fiber. 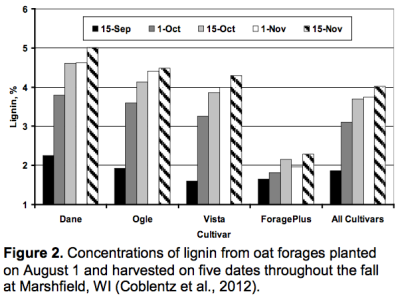 Figure 2 reports concentrations of lignin for the same fall-grown oat forages found in Figure 1. The most important observation is that lignin did not exceed 5% of DM for any cultivar on any harvest date. Furthermore, a November 15th harvest date is not realistic in central Wisconsin from a practical or production perspective; within this study, this effectively eliminates the harvest date that consistently exhibited the greatest concentrations of lignin. Averaged across all cultivars, this study suggests that harvests timed in late-October could be expected to yield oat forages containing approximately 3.7% lignin, which is only about 64% of the lignin concentration within cereal-grain forages summarized in Table 2. 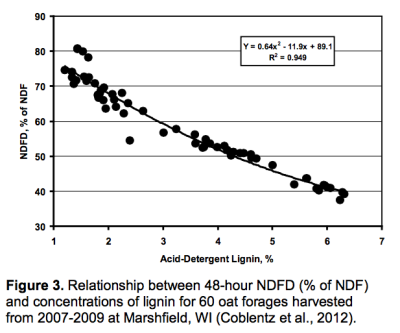 Lignin would comprise about 6.3% of NDF, and is greatly reduced from the 10% threshold reported in Table 2. Another important point from Figure 2 is that ForagePlus had much lower concentrations of lignin than any of the grain-type cultivars; this is likely related to the slower maturation rate for this cultivar that resulted in less-advanced growth stages on all harvest dates. From a practical perspective, reduced lignin within fall-grown oats is important because it strongly affects the digestibility of forage fiber (Figure 3). Two things are especially noteworthy. First, lignin has a direct negative effect on fiber digestibility, and can be used to explain virtually all the change in 48-hour NDFD across oat forages. Secondly, reductions in fiber digestibility are substantial, falling from about 80 to 40% of NDF as lignin concentrations increased from 1 to 6% of DM. What impacts do these factors have on the energy density (TDN) of fall-grown oat forages? A number of interacting factors affect estimates of energy (TDN) for fall-grown oat forages. Figure 4 summarizes the calculated estimates of TDN for the same oat forages discussed in Figures 1 and 2. It is important to remember that Dane, Ogle, and Vista are grain-type cultivars that have early, mid, and late-maturity ratings, respectively. As such, Dane and Ogle matured faster than other cultivars, resulting in greater concentrations of forage fiber (Figure 1) and lignin (Figure 2) on early harvest dates, which rapidly depressed estimates of TDN. These cultivars also were more mature at the onset of cold weather, and did not accumulate as much sugar as the later-maturing cultivars. As a result, TDN estimates for these cultivars stabilized at approximately 55% across November harvest dates. In part, stabilization of TDN occurred because the limited hardening and associated accumulations of sugar offset depressions in fiber digestibility. For Vista and ForagePlus, estimates of TDN did not really change after October 15th and October 1st, respectively, because these cultivars were less mature, and accumulated more sugar after the weather became cold. This was especially true for ForagePlus, where the combination of very late maturity, reduced lignin, and increased accumulations of sugar relative to other cultivars stabilized estimates of TDN at about 66% from October 1st through November 15th. From a practical perspective, this opens a very wide window for harvest during which forage quality is stable. It is important to note that the results found in Figure 4 are specific to an early August planting date. With earlier planting dates, grain-type cultivars matured more rapidly, and were too far advanced physiologically to harden when the weather turned cold. With later (mid-August) planting dates, all cultivars were relatively immature, and readily accumulated sugar; as a result, estimates of TDN were very high (approximately 70%), and varied only minimally across cultivars. For mid-August planting dates, the most important production limitation is yield, rather than quality. Fall-grown oats will accumulate significant amounts of sugar during the hardening process if the plants are not too mature when cold weather occurs. Generally, plants should reach boot stage around October 15th in order to achieve good yields of DM coupled with desirable hardening, but this will vary with cultivar and year. The cooler growing conditions during fall also will limit deposition of lignin and maintain good fiber digestibility. These factors work collectively to maintain TDN estimates over relatively wide harvest windows. Grain-type cultivars mature too quickly with July planting dates and will not harden or accumulate sugar; therefore, only forage-type cultivars, such as ForagePlus, should be considered for this (early) planting strategy. For (late) mid-August planting dates, cultivar selection will have only minimal effects on forage quality, and yield is the primary production limitation. Coblentz, W. K., M. G. Bertram, N. P. Martin, and P. Berzaghi. 2012. 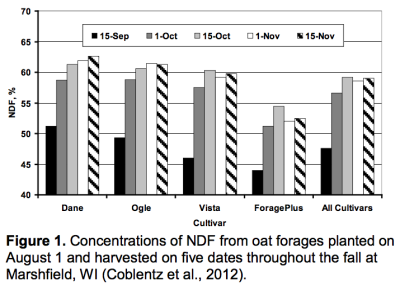 Planting date effects on the nutritive value of fall-grown oat cultivars. Agron. J. 104:312-323. Contreras-Govea, F. E., and K. A. Albrecht. 2006. Forage production and nutritive value of oat in autumn and early summer. Crop Sci. 46:2382- 2386.